There are days when life wants to throw us a curve ball, and it’s always something we never expect coming out of nowhere. Usually you can recover from this sort of thing relatively easily, but it will knock you off-balance. Of course, there are also days where life fancies pelting us with rocks. This is the day that everything breaks, explodes, and just plain goes wrong. Most people aren’t going to carry every tool in the garage on them, however, it would be nice if we could shrink down those tools and bring them with us. A miniaturized version of a screwdriver won’t actually do much good if it doesn’t fit the screw, but the Wallet Ninja can take on that task, and much, much more. This looks like a credit card that is half-way to being shredded, but can take on a variety of challenges. 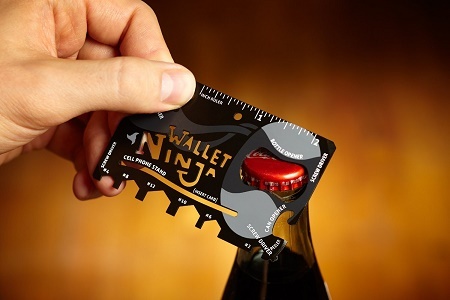 The Wallet Ninja is capable of performing the duties of 18 different tools. It can be a philips or flathead screw driver, bottle opener, ruler, phone stand, letter opener, 6 different sized hex wrenches, a fruit peeler, box opener, eyeglasses (what? ), and a can opener. It’s made of steel that has been heat-treated four times, which means it can take a beating from multiple uses in dicey situations. When not in use, it only needs to take up the space of one card in your wallet. For the convenience of having this many tools at the ready, you’ll have to be willing to part with $15 of your hard-earned cash. Seeing that having this sort of item around can sometimes save you a lot more, it’s usually worth having something like this on hand.